The growth of mobile devices is changing the landscape for enterprise authentication. A September 2010 Forrester Research Inc. report highlighted that 48% of organizations interviewed by Forrester across the globe will be spending on mobilizing enterprise applications in 2010*. 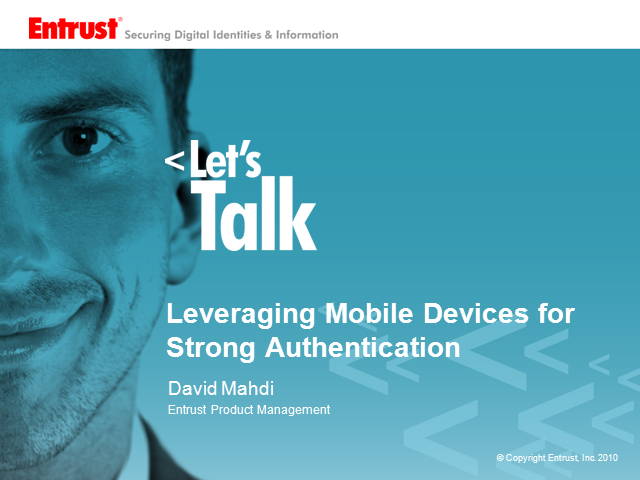 As mobile devices are used increasingly to access corporate networks, enterprise authentication strategies must consider how users can strongly authenticate to the network with these devices. Proactive organizations have the best interests of their employees, staff and resources top of mind. And it's critical to authenticate the identities that are granted sensitive access to networks, facilities, devices and more. Whether required by internal policy, industry mandates or government regulations, certain safeguards are needed to secure access points in enterprise environments. In this session Entrust will help organizations evaluate the many options and opportunities made possible by the ubiquity of mobile devices in the enterprise.